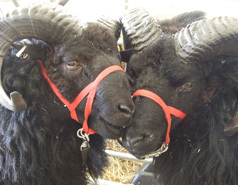 Showing Hebridean sheep: what should you know? Vicky Mason, Gordon Johnston and David Braithwaite provide a few tips. If you haven’t shown animals before, or indeed if you are familiar only with another breed or species, the thought of showing your Hebrideans can be a bit daunting, so these tips may inspire some more members out there to have a go. 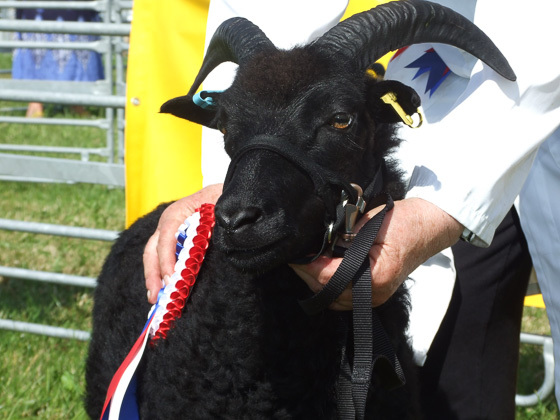 You don’t need to start at the top end such as The Royal Highland Show or the Great Yorkshire Show,-an increasing number of local shows now include native/primitive breed classes and these can be a nice introduction to a fun and, hopefully rewarding, pastime. Horns: what should they look like? Stating the obvious; the horns are on the sheep’s head and are therefore themselves obvious! They are an important consideration. 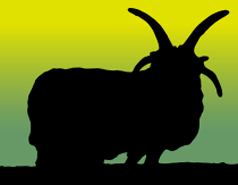 The style of horns is variable between individual animals and a wide range is acceptable in the show ring. Judges differ in what they find attractive but in general anything too wide or too tight is less favoured. In four horned animals finding symmetry between the two upper and two lower horns generally meets with mumbling approval from the judge. Horns go dull grey/brown with general wear and tear and so the question of whether horns should be oiled has always been left to the individual. Putting a small amount of light oil on them will bring out all of their natural colour, and it is the colour you want (not the shine). A moderate amount of oil on the horns will help set off on the head as well as giving a clean overall appearance. On a ewe, it adds to the attractive appearance, while on a ram, it can tidy up scuff marks and fighting scars. However, please don’t overdo this as the judge will not enjoy the oily experience . Ideally, any oil should be applied a day or two before the show as this will allow time for it to sink in and lose the gloss. `Baby oil` is often used instead of hoof oil and is generally more user-friendly. Whilst some may consider oiling to be outside the term of 'natural', it is only bringing out the colour that is already there. Fleece preparation: is there any need? It is usual, unless stipulated for a particular class, to show Hebrideans in the new season’s wool. Some of the shows that occur early in the year don`t really allow much time for regrowth of wool after clipping and a small number have classes for sheep 'in wool' i.e. not yet clipped. There is no doubt about it, Hebrideans look better with a good covering of fleece without any evidence of shearing blows. The timing of when to clip your sheep for showing will therefore need some careful consideration. “Animals should not be backed down, trimmed or excessively brushed”; so read our only showing rules, but why and what is deemed acceptable in the show ring? The idea is that Hebrideans should be shown in a 'natural' state, but this does not have to mean straight from the field with no attempt at enhancement. As exhibitors it is up to us to exhibit the sheep to their best advantage within the rules, not just with the aim to win prizes, but also to show the rest of the sheep world what an attractive and practical breed they are. 'Backing down' as practised in `Down` breeds, would change the shape of the animal and that, together with trimming would also destroy the natural appearance of the fleece. Anyone who has ever tried to really brush a Heb will know that the end result resembles a fluffy cartoon sheep, ready to take off in the first wind and it also completely ruins the structure of the fleece. Ideal preparation would involve standing the animals outside in a heavy thunderstorm the day before the show, followed by gentle breeze and sunshine to do the drying. This is the 'natural' effect we are trying to achieve, but the elements are not always that obliging! Fleeces pick up all sorts of dust and debris and if you have had your sheep on pasture with thistles, burdock, goose grass or anything else clingy, you will have seen it for yourself. This is no way to show a sheep, especially not one with a black fleece. Wash the fleece with plenty of water (use no colouring agents) about a week before the show and then remove by hand all of the bits that didn`t wash out - no matter how time consuming. Transporting your sheep to the show with any risk of hay or wood shavings getting into the fleece spells disaster. Judicious use of the water-spray is acceptable on the day, both to refresh the fleece after travelling and to add some shine and, let’s face it, they always appear blacker when wet! Don’t overdo it, as the drowned rat look doesn’t improve them a lot. The `back end` can be problematic and you must remove all of clarts, soft or hard. Soft clart can be washed out; the harder stuff will require clipping out.However, if by the time you have finished, your sheep is nearly bald and you have lost the `flow` of the fleece over the rear then you don`t have a show sheep! Being vigilant and sorting your sheep out with appropriate medication before they get too 'clarty' is therefore a prudent measure and also better for your sheep. Many judges would say yes. There are a few things to remember here though. 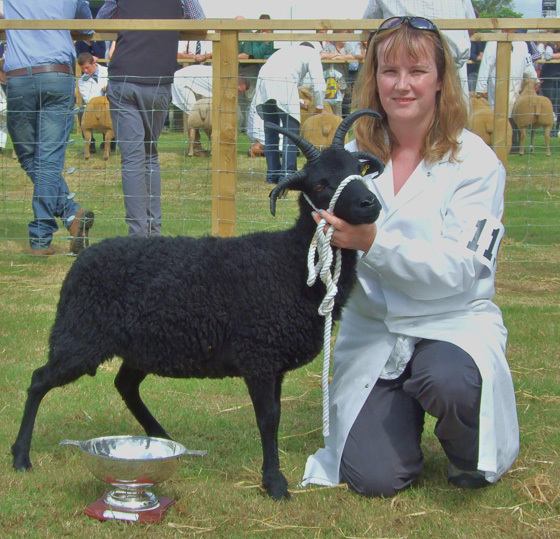 Hebrideans display a variety of fleece types and it is only relatively recently that very black fleeces have come to dominate the show ring. If you have a good sheep with an old type fleece i.e. with some grey/brown fibres, don’t be put off entering the line up. Lamb`s wool is softer than older animals and therefore more prone to the tips of the fleece fading to brown with sunshine. 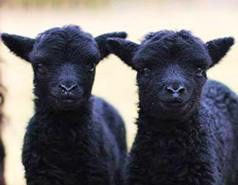 This is not a fault but if there were two otherwise identical lambs in a line up and one was black and the other brown-tipped, it is very likely that the judge will go for the black one. This is of course a hypothetical situation, as there are never two identical lambs; but hopefully you get the point! As Hebrideans get older they should start to show some grey fibres, this is part of what Hebrideans are. This will be variable between individuals and animals that are excessively grey no matter what age, never make good show sheep. Halters are a practical means of getting your sheep safely and comfortably from pen to ring and back again. Dragging sheep by their horns is to be avoided. But if your sheep is experiencing a halter for the first time on show day be ready for an interesting and strenuous time in the ring! Your sheep will need to spend time getting used to the halter, this will take a couple of weeks of short sessions. Some animals take to it more readily than others. Be patient and steady in your training sessions. The good news is that once halter trained an animal remembers it for life. Be aware that at some (securely fenced!) shows, the judge may want the animals to run free in the ring, and may ask for halters/head collars to be removed. Don’t worry if this happens as everyone will help with the subsequent rounding up. Once back in the line-up, the decision as to whether or not to show on halters is left up to you, but as the aim is to show the correct conformation of the animal, you should be aware that getting a sheep to stand properly whilst being held under the chin takes a lot of experience and is at least as much work as halter training. When handling your sheep `in the line` you are wanting to show your animal off to its very best i.e. standing square with a leg at each corner, head up and looking alert. This gets to be hard work if your sheep has absolutely made its mind up that it doesn`t want to be shown off to its best. This can become a battle of wills, make sure yours is the stronger. Remember that your sheep can never look alert if you aren`t. Your judge wants to see your sheep, not different parts of your anatomy and the way you handle your sheep will have a direct effect on that outcome. The more you and your sheep can practice before the show the better. What type of headcollars are suitable? 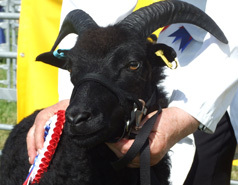 Vicky Mason (who is highly experienced and successful at showing Hebridean sheep) comments. "My own leather headcollars were made by a saddler and would be mighty expensive these days since I had them done at least 25 years ago! I think these headcollars suit rams very well. Peaseridge do a variety of leather headcollars. They also do the lead reins but I just use a leather dog lead. Many people use rope halters, which can usually be found at your local agricultural merchant. Finding the finer rope sizes is important as the larger rope does not hold over the dainty nose of a Hebridean. I am not keen on these as once they tighten they are hard to loosen off again and must be uncomfortable for the sheep if they struggle. I think that the flat white webbing halters are better but I haven’t been able to find any for quite a while. I prefer to show ewes in these halters as I think that the white draws attention to the head but a good supply is needed as they inevitably get dirty very quickly. More and more people are however now using the Halti headcollars that are made for dogs and can be obtained from most pet stores. They come in various sizes and colours (although being a tradionalist, I prefer black) and are much cheaper than leather. I find size 3 suitable for ewes although I believe other Hebridean breeders have used size 2, so it’s a bit trial and error. They are handy should the judge wish to see the sheep running free in the ring as the lead can be unclipped and re-attached quickly. This is far better in my mind than trying to tie a halter lead up neatly at the back of the sheep`s head." Don`t take your sheep to a show if it isn`t looking in good condition; if it is scouring, lame, has signs of eye infection or blistering around the mouth leave it at home. Your sheep will change during the season -this is particularly the case with youngstock. When a sheep is in its peak show condition it is sometimes described as being at 'twelve O’clock'. It is very difficult for any animal to look its best throughout the whole season and so selection of show sheep will depend on how close to twelve O’clock you consider them to be for any given show. Spend time watching your sheep behaving naturally in the field, that way you will get the best idea of how they are developing. Although Hebrideans are a primitive, hardy animal they still require some condition in order to compete in the show ring, even ewes with lambs at foot will have their backs felt by the judge. This is not to get them fat as that is just as wrong as animals with no condition. You will therefore want to have your show sheep on your best keep. If you have no choice about which keep they can run on then you might consider some supplementary feeding. Finishing touches can count especially if you get through to the interbreed sections so don`t forget your sheep`s feet. They often need a bit of trimming come show time. There seems like lots to think about but don`t let that put you off, everyone in the show ring with you started out somewhere and has learned `on the job`. Remember, the judge has been appointed to do a job based on their experience and preferences and if they stick to that then their decisions are the right ones. If your sheep didn`t catch the judges eye on this occasion don`t be too disappointed; watch, learn and keep at it … the rewards will come. Finally, if you are unsure of anything, watch or ask those who have been doing it for a long time, they will be pleased to help and will encourage you to participate. 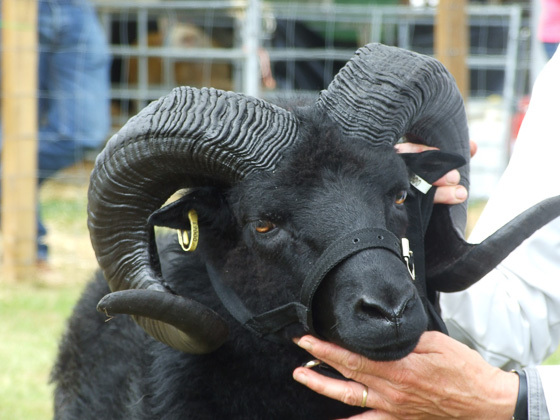 Further reading can be found in our book - Hebridean Sheep; Old Breed for New Times - in which there is a whole chapter on showing sheep.